Just when I thought mojitos couldn't get any better, I took a sip of this pineapple coconut mojito and my mind was blown. I just wanted to get that out in the open from the start. I just got home from Tennessee moments ago. On our way home from the airport, we made a quick stop for some tacos and ingredients for making margaritas to celebrate Cinco de Mayo. The weather is absolutely perfect and so we sat in the backyard. It was a relief to be home even though our visit to the South was so lovely. There is just nothing like your own home, is there? Tonight was the first night that made me crave a mojito. My cocktail preferences change accordingly with the weather (except when it comes to red wine- that is something that needs no appropriate season) and this week is a mojito week for sure. The nice people at Blue Chair Bay Rum sent a bottle of their coconut rum my way and, muddled with fresh pineapple and mint leaves, it made a superb cocktail. You know how some sunscreen smells like a piña colada? That's what I thought of when I took the first sip. No, it doesn't taste like sunscreen. I promise. I have to be honest and say that coconut rum is typically the last thing on my mind when I think about stocking my liquor cabinet. But I'm actually quite happy this bottle made its way into the mix. I think it will be a wonderfully refreshing addition to summer cocktails with friends. And the bottle is so pretty! One last little tidbit of information for you- did you know today is National Beverage Day? It is! What better way to celebrate than with a fresh, tropical mojito? 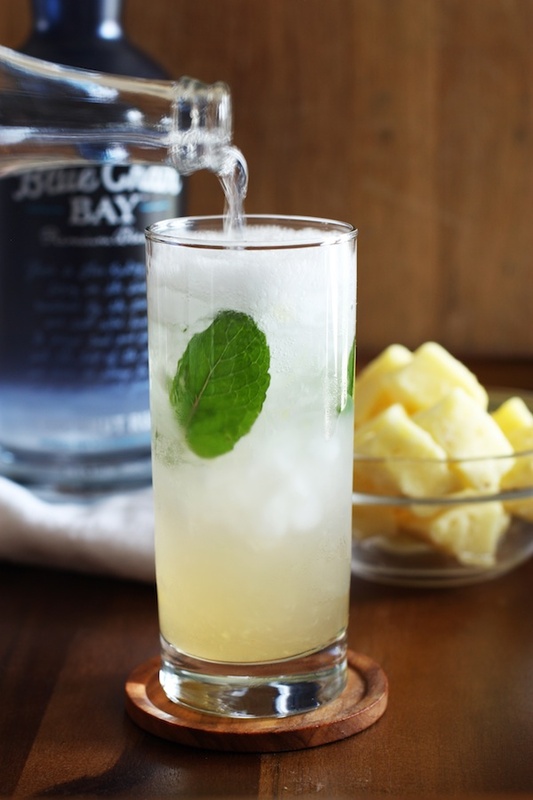 To learn more about Blue Chair Bay Rum, check out their website by clicking here. You can also give them a 'like' on Facebook by clicking here. In the bottom of a cocktail shaker or large glass, muddle the pineapple with the mint leaves and rum. Strain into an ice-filled cocktail glass and garnish with the extra mint leaves. If you can't find good fresh pineapple, go ahead and use frozen. Do NOT, under any circumstances, use canned pineapple. Just say 'no'.